Our Proven, Step by Step, Forex Masterclass Has Already Created 100’s Of Successful Traders Before You & Can Help You Start Trading Profitably And Consistently – In As Little As 90 Days Or Less! Isn’t it time you separated from the beginners & amateurs and joined the experts? Trading is not something you should be taking lightly and neither is your education. How many youtube videos and free guides must you take before you take real action to obtain real results? You wouldn’t want a surgeon who Youtube’d “Open Heart Surgery” to perform an operation on you, would you? You must stop living in dreamland where the idea of making money from trading feels A LOT better than putting in the work, effort and money (and losses) to learn and take risks to become the ideal trader you have a picture of in your mind. Trading and making money is an ART and it has been LOST. Even in today’s teachings online, you are NOT even taught how to properly execute a trade… Trust us, this is one of the most common problems we fix and it can save you A LOT of money. What you will learn is the EXACT SAME process successful traders have been monetising from for DECADES. The strategies, execution plans, frameworks and systems included in this Forex Masterclass have been fine-tuned and brought up to speed in the 21st Century. Discover where the smart money is (Hedge Funds, Institutions, Family Offices and Investment Banks.) & how you can take advantage of this. Alphaex Capital has done a great job with how the course and chapters are structured in terms of letting you get a feel for forex and what it entails also what it takes to be successful which most of the times is not told to people. I got a very clear understanding of the different strategies and indicators that is available to also made it very easy for me to understand which methods I would be comfortable using. I learned how to scalp years ago and barely made anything, plus what I learnt made me anxious at every trade. Reviewed this Forex Masterclass and I’ve definitely taken it up a gear… Trading on higher timeframes and understanding when to increase and decrease risk is something I totally overlooked. The strategies work too, I only implement 3 of them on a daily basis and so far so good. Review performance, request to take on the 90-day challenge and fund your broker account. Continue trading with the Alphaex Capital trading community to further your success. STRATEGY 1: Quite possibly one of the most powerful indicators a trader MUST have in their toolbox. This strategy can generate very POWERFUL trading signals that can lead to huge moves. 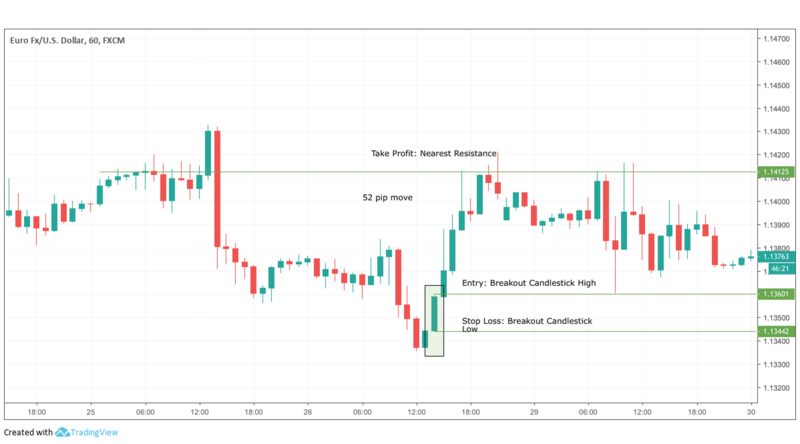 STRATEGY 2: This is your bread and butter strategy – learn how to effectively trade specific trading setups where the probability is STACKED in your favour. STRATEGY 3: This strategy has been used since day 1 of the financial markets being open and is still as effective as it was back then. Professional traders use this strategy each day. 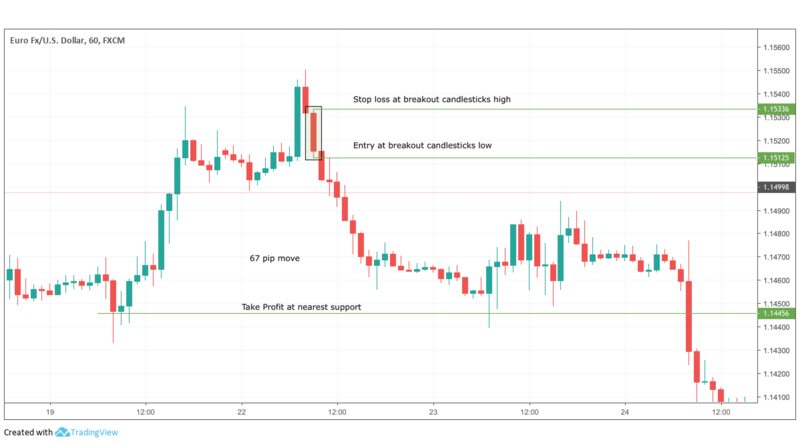 STRATEGY 4: This is a strategy used by professional traders looking to take advantage of immediate volatility and an increase in trading volume. 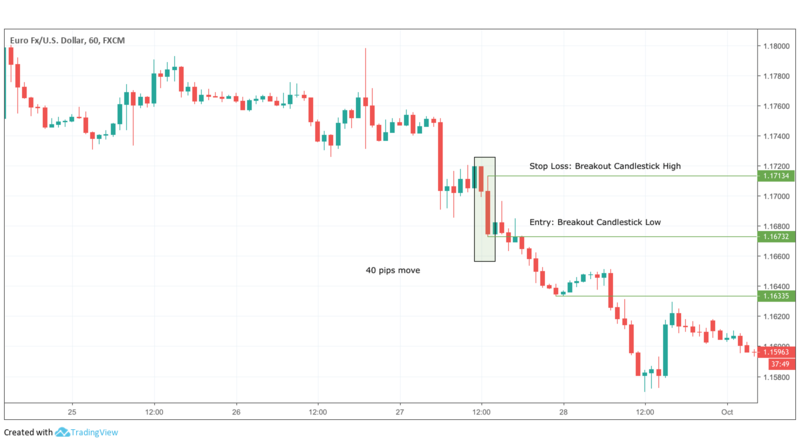 This strategy can pick out the trading day’s trend for the day. STRATEGY 5: This strategy relies on 3 indicators but the idea behind this strategy combines mean reversion and trend following indicators that work in any timeframe. STRATEGY 6: Majority of the trading world wants you to use the Simple Moving Average, yet with this strategy, we use another indicator to highlight strong breakout opportunities. This is the simplest strategy we offer, yet can be powerful. STRATEGY 7: This strategy is best for traders who want a strategy that is consistent and avoids following chart patterns etc. This is an adaptation of a scalping system unique to Alphaex Capital. Please note: past performance is not an indicator of future performance. Performance does not include fees and costs incurred such as spreads and interest. In this example, the strategy signalled a breakout to the upside. Trading this signal would have generated 43 pips profit, whilst risking 20 pips. At $10 a pip that’s $430 profit. In this example, the strategy signalled a breakout to the downside. Trading this signal would have generated 44 pips profit, whilst risking 30 pips. At $10 a pip that is a $440 profit. In this example, the strategy signalled a breakout to the downside. Trading this automated trading signal would have generated 43 pips profit, whilst risking 20 pips. At $10 a pip that is a $430 profit. In this example, the strategy signalled a breakout to the downside. 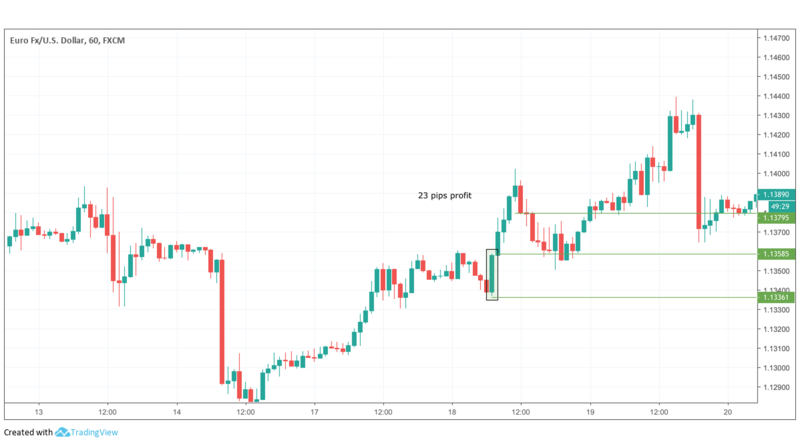 Trading this breakout would have generated 76 pips profit, whilst risking 28 pips. At $10 a pip that is a $760 profit. In this example, the strategy signalled a breakout to the downside. 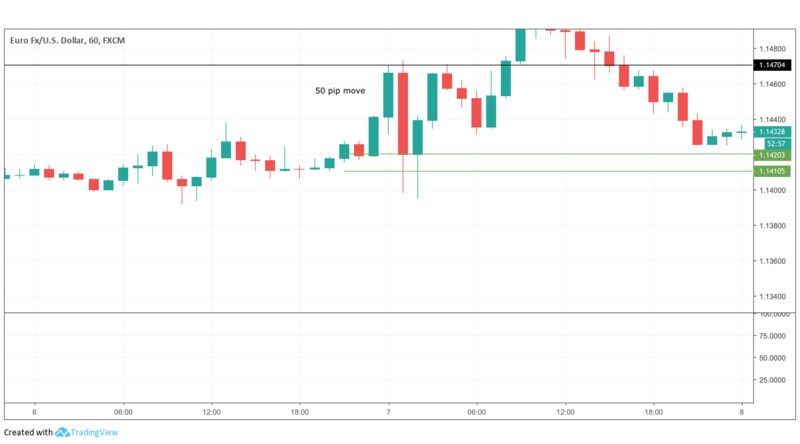 Trading this breakout would have generated 50 pips profit in 50 minutes. At $10 a pip that is a $500 profit. In this example, the strategy signalled a breakout to the downside. As you can see, this strategy can define the day’s trend. Trading this breakout would have generated 143 pips profit. At $10 a pip that is a $1430 profit. 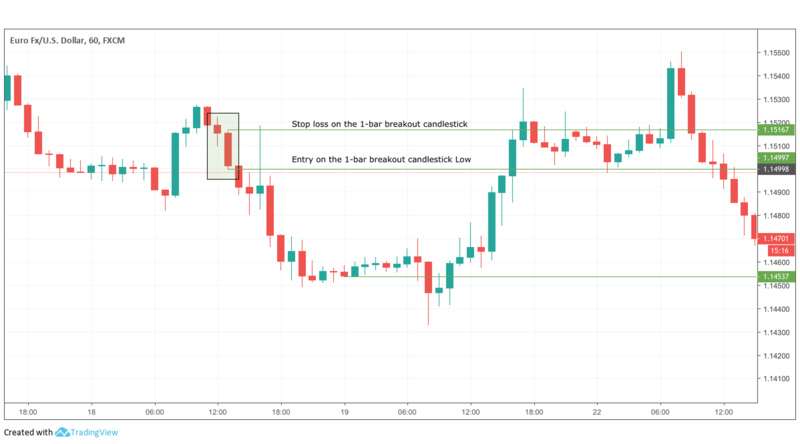 In this example, the strategy signalled a bullish trading opportunity. Trading this signal would have generated 37 pips profit. At $10 a pip that is a $370 profit. In this example, the strategy signalled a bullish trading opportunity. Trading this signal would have generated 40 pips profit. At $10 a pip that is a $400 profit. In this example, the strategy signalled a bullish trading opportunity. Trading this signal would have generated 89 pips profit. At $10 a pip that is an $890 profit. In this example on the daily time frame, the strategy signalled a bearish trading opportunity. Trading this signal would have generated 165 pips profit. At $10 a pip that is a $1,650 profit. 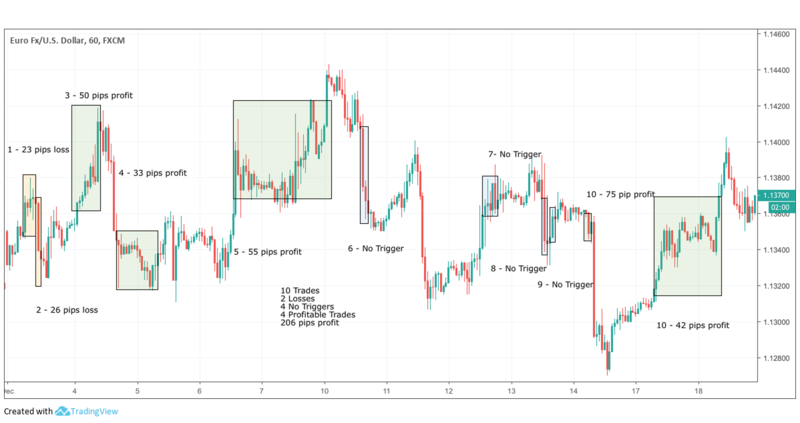 In the image above, we have plotted all the trading opportunities Strategy 5 generated over the month of December 2018 generating over 699 pips potential profit over the course of 1 month. In the image above, a sell breakout signal was triggered. Taking this signal would have generated 33 pips profit. In the example above, a buy breakout was executed taking a 52 pip profit. In the example above, a buy breakout was executed taking a 73 pip profit. In the example above, a sell breakout was executed taking a 77 pip profit. 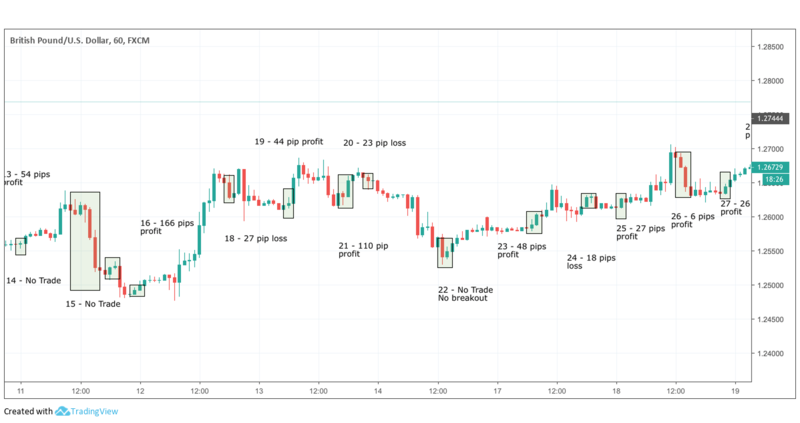 In the image above we’ve highlighted all the trading opportunities in December 2018, which would have generated 206 pips profit. 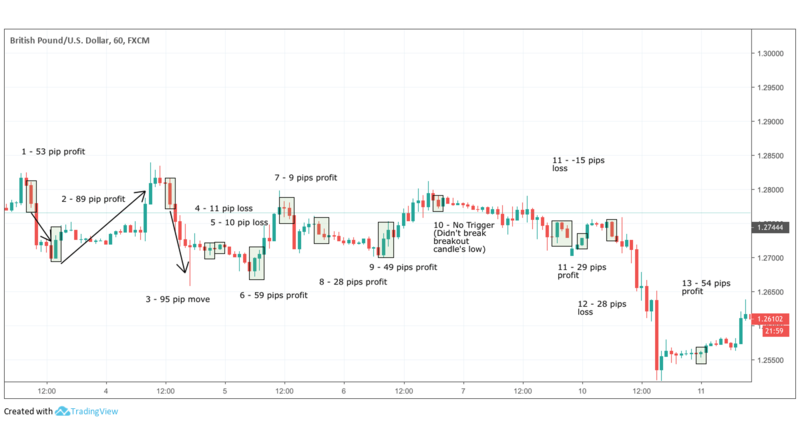 In the example above, Strategy 7 gave us a quick buy signal to generate 22 pips profit. 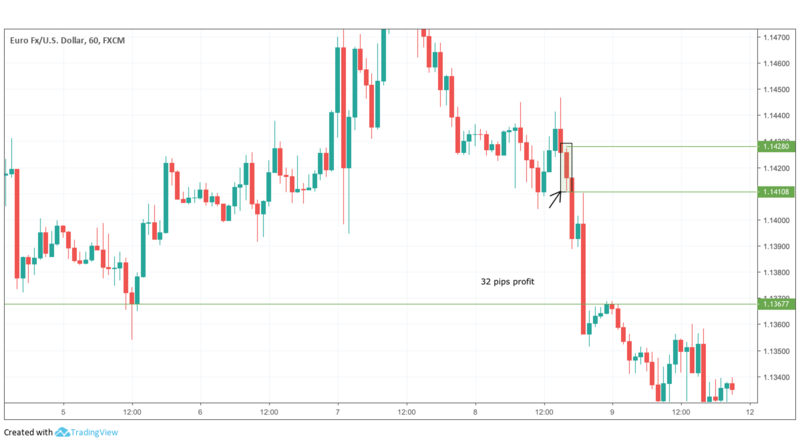 In the example above, Strategy 7 gave us a quick short signal to generate 33 pips profit. In the example above, Strategy 7 gave us a quick sell signal to generate 40 pips profit. In the example above, Strategy 7 gave us a quick sell signal to generate 46 pips profit. In the example above, Strategy 7 gave us a quick buy signal to generate 50 pips profit. In the example above, Strategy 7 gave us a quick buy signal to generate 52 pips profit. In the example above, Strategy 7 gave us a quick buy signal to generate 67 pips profit. 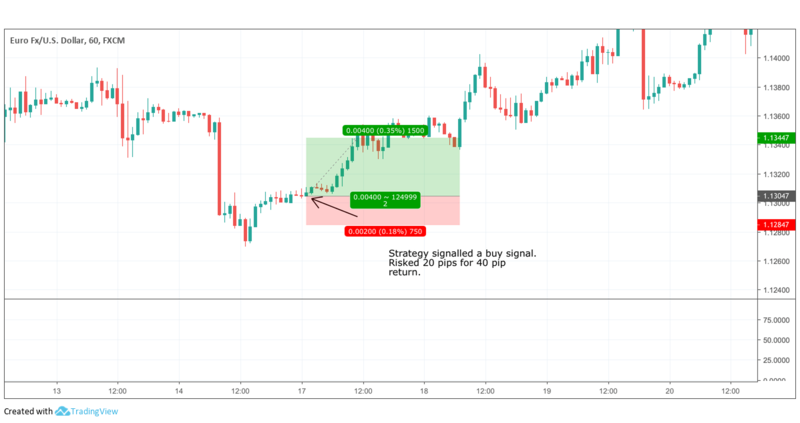 In the example above is all trading signals generated by Strategy 7 in December 2018, this is between 1st Dec and 11th and it generated 400 pips potential profit. 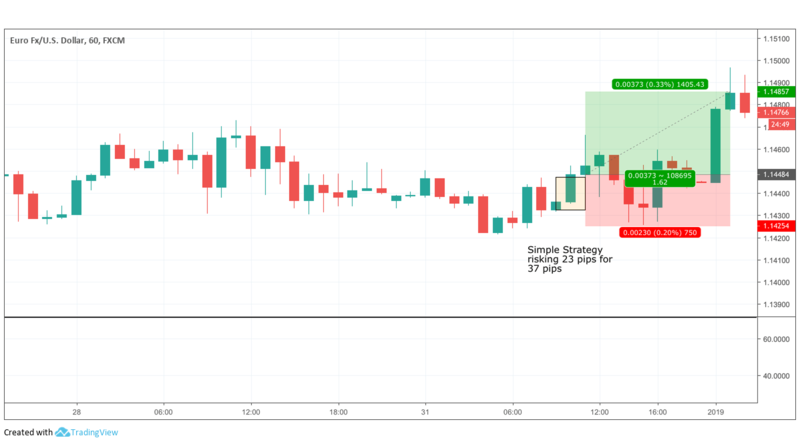 In the example above is all trading signals generated by Strategy 7 in December 2018, this is between 12th Dec and 19th and it generated 359 pips potential profit. 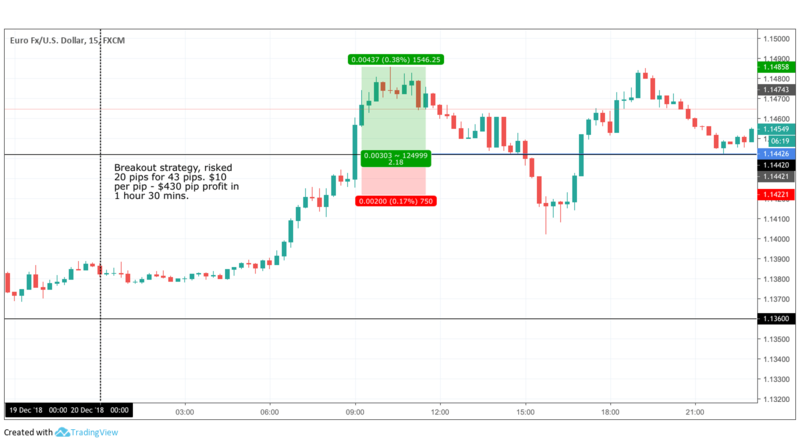 In the example above is all trading signals generated by Strategy 7 in December 2018, and it generated 961 pips potential profit. I learned a lot of the basics on Babypips which was a great foundation for understanding the markets, but they didn’t really give me anything applicable to go and learn from. I found this masterclass through Google and after a lengthy live chat and e-mail conversations, I finally got a copy of the Masterclass. They actually directed me to parts of the course that would be most relevant to me immediately to apply and top up my knowledge from Babypips which made it easy for me. Some info. 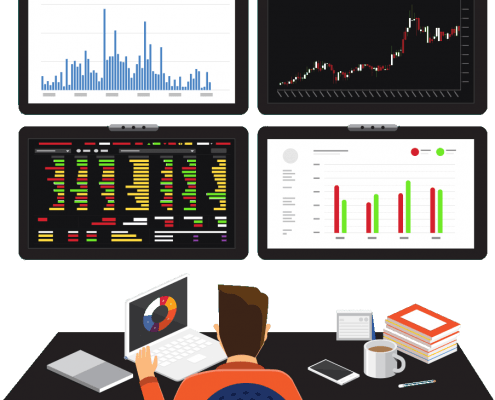 is for complete beginners (if you have no idea about the Forex markets then they hold your hand), but the more actionable knowledge in there is fantastic. Exceptional service from start to finish. Not only do you get a huge course to go through but you can e-mail their support team who are friendly and help you understand some of the advanced concepts in here (plenty of examples to go through). 7 trading strategies that uncover opportunities every day. (WORTH £200)*… FREE – these strategies alone could help you spot near term trading opportunities. Is this Forex Masterclass right for me? What happens after the Forex Masterclass ends? Your Forex trading expertise will go up. Getting to know the right tools and processes will 10x your effectiveness as a trader. You will be able to contribute and hold strong conversations about the current market climate and future market movements. Become an active member in our Trading Chatroom and Groups. You will stop dabbling in the markets and start taking it seriously with your proven Framework. You can ask questions via the support group and e-mail channels to enhance your knowledge even further. Is this suitable for an intermediate level? Yes. 2. It weeds out the freebie-seekers. We only want serious traders who take action, and in our experience charging anything…even if it’s just a £1… gets rid of 99% of the tyre-kickers. We also believe that once you experience this Forex Masterclass, you’ll want more and maybe…just maybe…you’ll come back and buy more. Remember, we will spill the beans on the exact same processes that have been the common traits and patterns of successful traders. Much of these methods have been lost in translation… We have years of industry knowledge and experience to back this up! If you’re serious and you want to learn exactly how to trade for a living, become a better trader, and become consistently profitable, then this is the first and best step. Not only does it work, at only £250 it’s the tiniest investment you can make and still have a realistic expectation of results. Our customers started where you are, join them today. Trading on margin carries a high level of risk and may not be suitable for all investors. You may lose all your capital. Loses can exceed deposits. Past performance is not indicative of future results. If you are in any doubt about investment or the mechanics of such products, you should seek independent financial advice. ALL WEBSITE CONTENT IS PUBLISHED FOR EDUCATIONAL PURPOSES ONLY.